Our vision is to see the Beaufort-Delta Region of Canada's western arctic become the dream destination for motorcycle adventure enthusiasts from around the world. We will be the catalyst for your ride of a lifetime ! ​The initiative was born out of my personal fascination and love of motorcycle adventure riding and my goal of sharing this unique experience with as many adventure riders as possible . The Dempster Highway has been my road of choice for many years as i was born and raised in the Mackenzie -Delta Region and have travelled this highway for two decades ,i have extensive knowledge of the weather patterns and road conditions along with solid contacts for real time information for a safe and fun adventure . Although the word “adventure” usually associated with expert motorcycle riding tends to give the wrong connotation of an activity full of dangers . For those who embrace motorcycle riding as a hobby and a lifestyle, "adventure" symbolizes the essence of motorcycle riding: crossing new boundaries and reaching new limits. 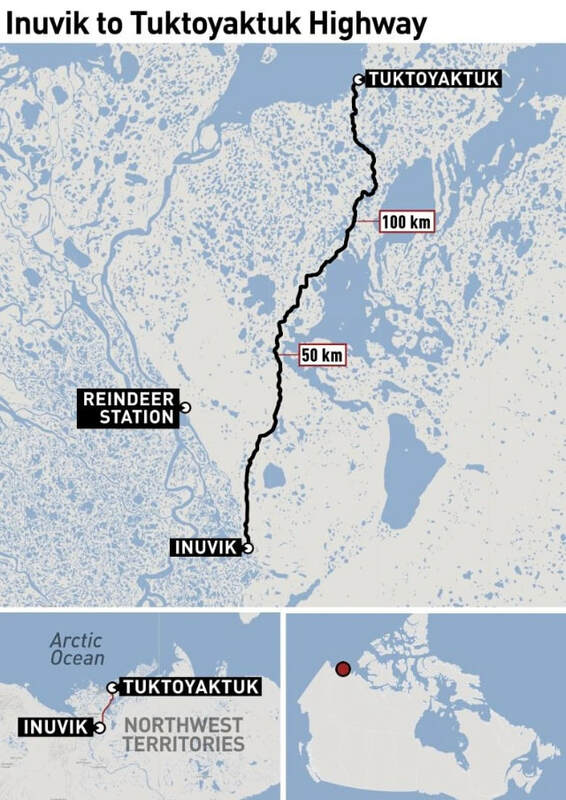 This is exactly why the opening of the Inuvik-Tuktoyaktuk Highway has motivated such an excitement among adventure motorcycle riders all over the world.The Highway provides the missing link for adventure . Join us for a spectacular experience of the Northwest Territories. With a one-night layover, Inuvik is reachable from anywhere in North America within two days. There are daily flights from Edmonton, Yellowknife and Whitehorse. And weekly flights from Vancouver, Calgary. ONE GREAT OPTION IF YOUR RIDING TO DAWSON CITY YUKON , AND NOT SURE OF RIDING THE DEMPSTER OR DUE TO BAD WEATHER ,THE ROAD BEING CLOSED IS TO FLY FROM DAWSON CITY TO INUVIK AND WE PICK YOU UP AND TAKE YOU TO THE ARCTIC OCEAN AND DIP YOUR FEET IN THE WATERS EDGE , ALONG WITH A COMMUNITY & CULTURAL TOUR .